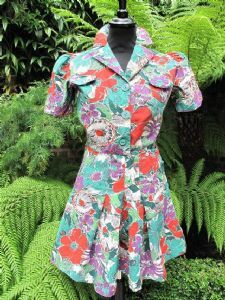 Classic 1940's styling with this Printed Cotton Playsuit, which features a front fastening bodice with two small pockets with flaps and a shirt style collar ....short puffed sleeves with pads ...and flared leg shorts with inverted pleats and side button fastening. The buttons are a jade green sunburst etched plastic. 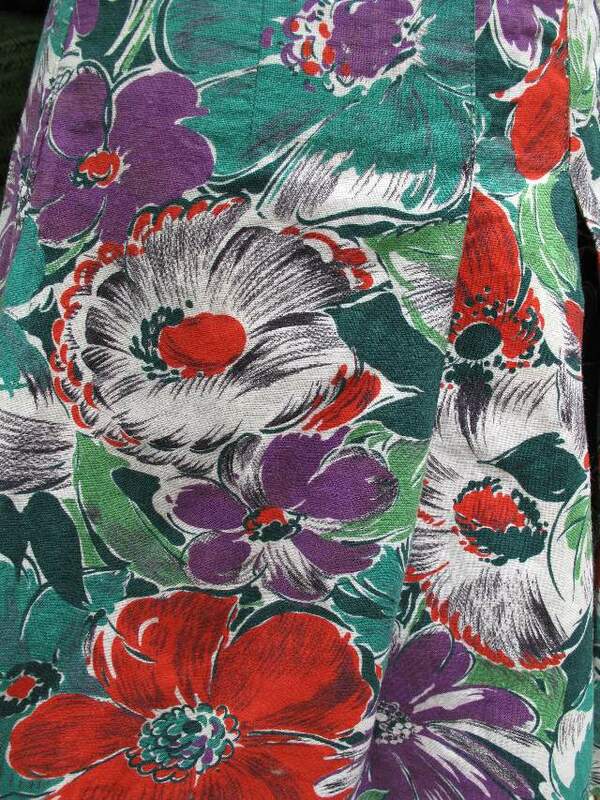 The Print features tropical / jungle flowers in Scarlet, Purple, Jade and Emerald...on a white base. 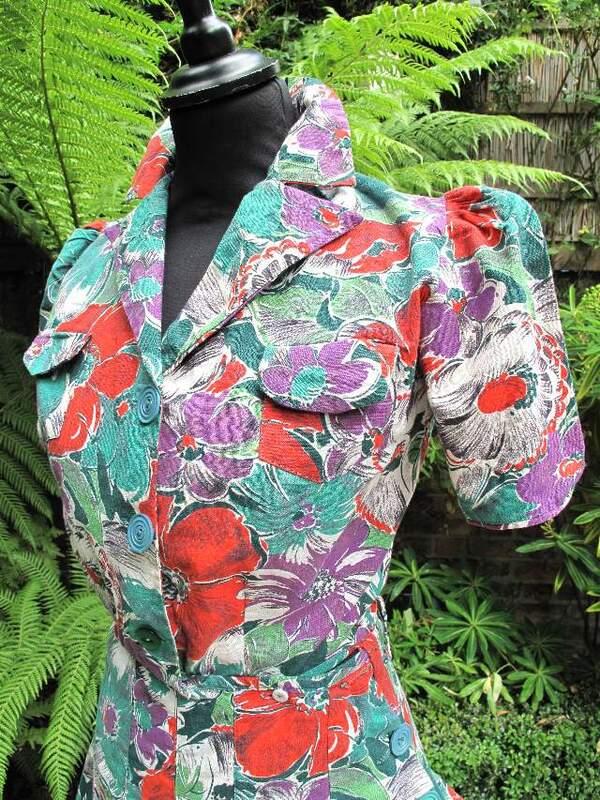 This is a true Vintage Collectors piece... but still eminently Wearable ! Measurements are taken in inches and are the Maximum measurements . Please ensure fit before purchase as all sales are final. International is signed for delivery. 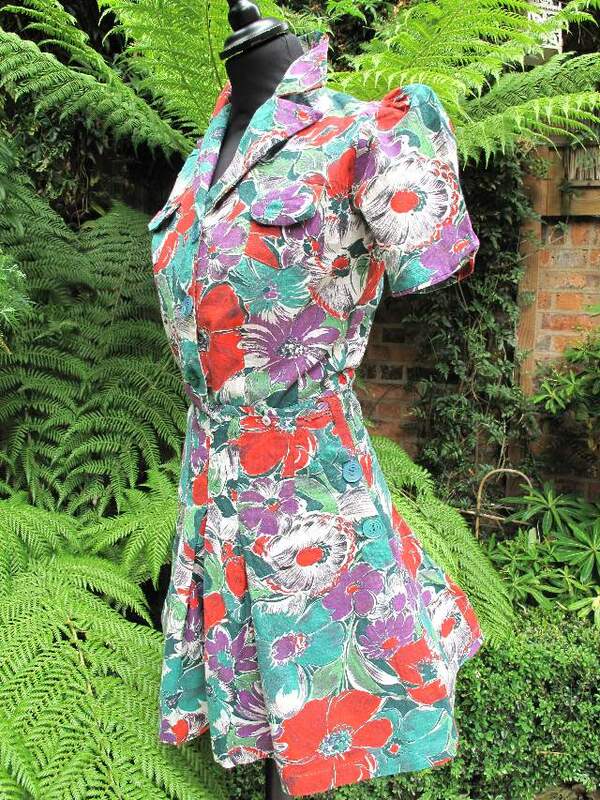 Please remember the individuality and romance of Vintage clothing is enhanced by the fact it is pre-loved and worn. There will sometimes be slight evidence of this, but we will always mention any noticeable flaws or damage. MINT - Perfect ….. looks unworn, no visible flaws. EXCELLENT - shows very little signs of wear. VERY GOOD - minor signs of wear, light fading or underarm discolour, tiny holes or minor repairs. GOOD - item is wearable with some signs of usage or signs of minor repair, which does not affect it’s wearability . No returns are accepted for not fitting ,dislike of colour or change of mind…. please contact us with any questions if you are unsure. Returns will ONLY be excepted if the item has been grossly misrepresented. Please remember you are buying from a computer screen and variances of colour can occur according to appliances. 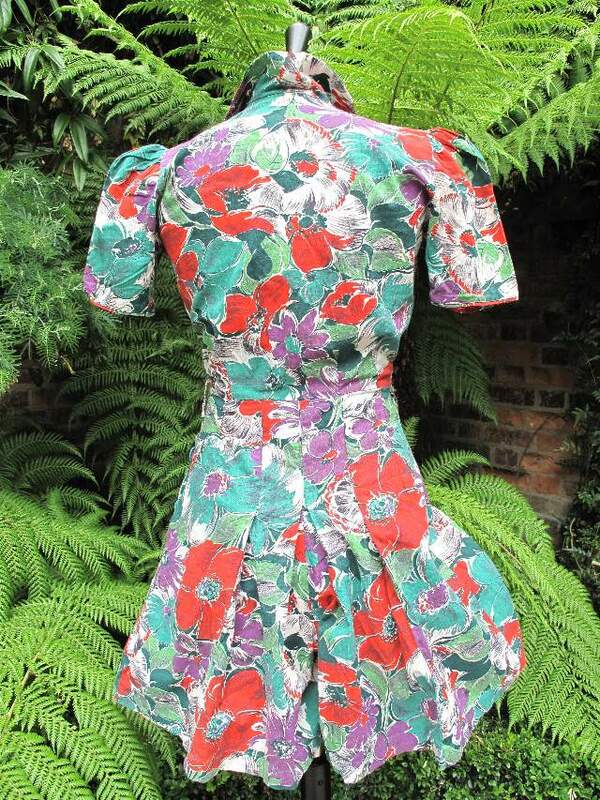 Please double check your measurements and always remember our mantra…that true vintage is pre-worn and pre-loved and ‘too good to be forgotten’. In the event you are really unhappy with your purchase please contact us and we can discuss a possible compromise. PLEASE NOTE; WE ARE NOT LIABLE FOR CUSTOMS OR OTHER DUTIES THAT MAY BE DUE ON YOUR PURCHASEClassic 1940's styling with this Printed Cotton Playsuit, which features a front fastening bodice with two small pockets with flaps and a shirt style collar ....short puffed sleeves with pads ...and flared leg shorts with inverted pleats and side button fastening. The buttons are a jade green sunburst etched plastic.